TWMLA is very pleased to announce that the SUNY Orange Rowley Center for Science and Engineering has achieved LEED Gold Certification from the U.S. Green Building Council. TWMLA provided the site design with several green infrastructure techniques, including bioretention and green roofs, which contributed to the LEED Gold achievement. An integral part of the design was the marriage of building and site to reinforce the idea that learning happens everywhere on the campus. 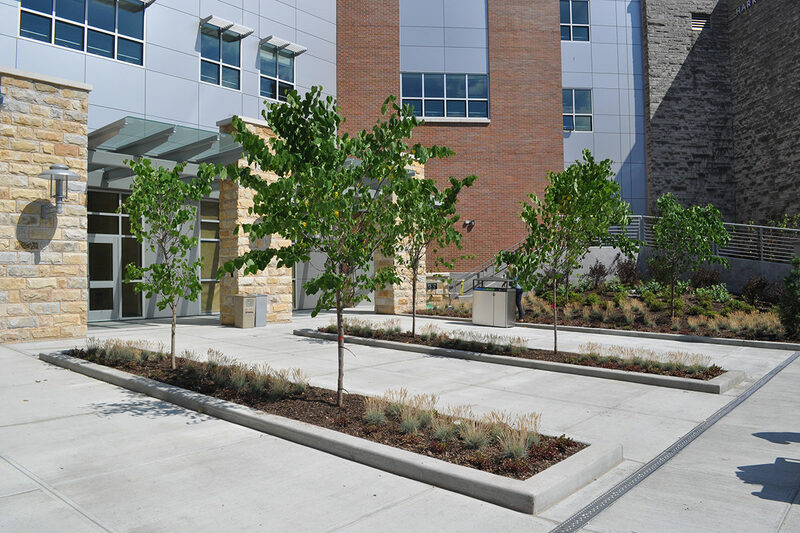 TWMLA’s pedestrian plazas infiltrate and treat stormwater runoff in attractively planted stormwater basins, which serve as outdoor classrooms while also providing year-round aesthetic interest. By selecting full cut-off fixtures for the site lighting, the green roof area was able to accommodate astronomy classes, while also infiltrating stormwater. Inside the building, the electrical, heating, cooling, and plumbing systems were all designed to be examined by students. A first-floor monitor displays in real time the electrical energy generated from the rooftop photovoltaic panels.